When your Alma Mater calls looking for a designer, better answer. Texas State University Alumni Association's challenge is that their alumni is vast, stretching decades in existence, yet with no feasible way to unify the masses. Their old site was dated and there was no database in place to capture user data, build profiles and make online donations. A responsive site was designed to help build community, instill pride and provide a way to reunite academics and tailgaters alike to a common environment. Great question. The common thread leads back to the experience of the campus, the feeling of community and involvement. The goal was to capture this feeling, along with the takeaway for users to sign up and join the Alumni Association, no matter their age or graduation year. This project entailed discovery and research, along with UX/UI strategy, site content audits and site architecture planning. Wireframes led the discussion to the final result, which focuses on accessibility, speed of information and convenience. 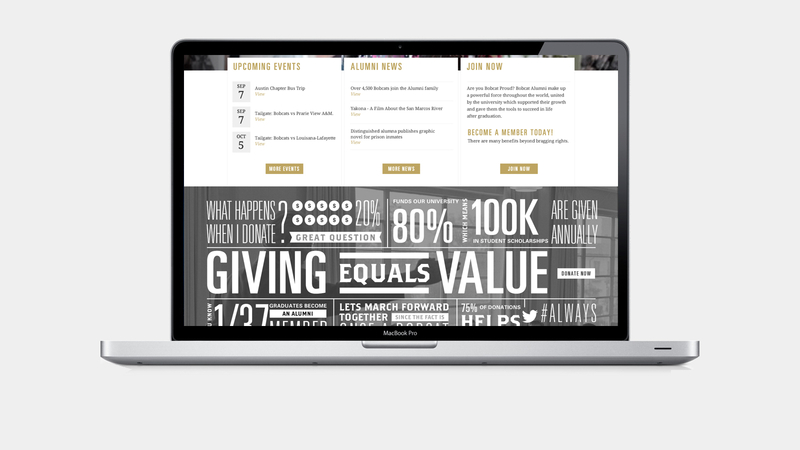 The ability to donate seamlessly, and easily, was a requirement, as well as cleaning up the existing site to a more clean UI that reflected the established brand of the University. 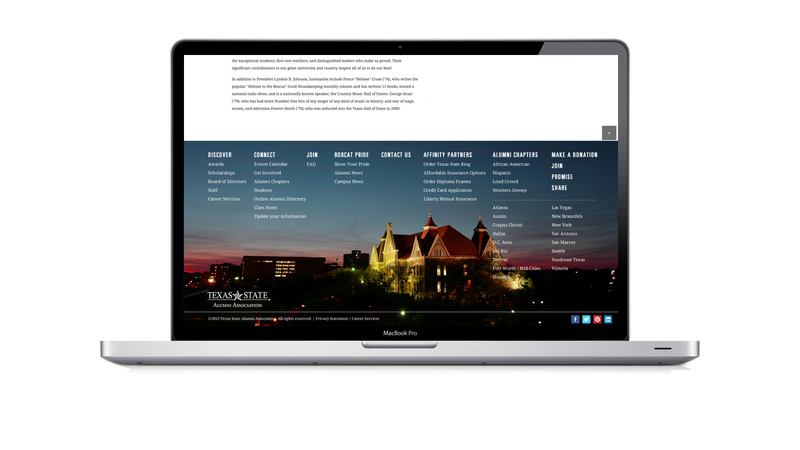 Not only does the site tell the history of Texas State University, but also gives the user a sense of pride (and benefits) for joining the Alumni Association. The opportunity to create a user account and connect with other Bobcats, along with relevant news on alumni stories, become a focal point. Designed by Shawn Meek | Developed by Blackbaud.